Last time, I described my first few weeks of employment with the Indiana Hi-Rail Corporation (IHRC), and my initiation at Connersville, Indiana. I had been hired to work in the railroad’s Defiance, Ohio office, but a delay in completing the lease agreements for the Maumee District line from Norfolk Southern meant that I temporarily had nowhere to work. So, towards the end of the September I received word that I needed to go down to IHRC’s Evansville, IN office. I set out from Connersville one morning, and it was on that trip that I realized what a big state Indiana is. The drive to Evansville seemed to take forever (at least 5-6 hours). There was a long stretch on I-64 in southern Indiana where it was 20-30 miles between exits! But it was a nice fall day, and the sun was shining, and upon arrival I threaded my way through Evansville, arriving at the IHRC Harwood Yard, which was to be my home for the next several weeks. A view of IHRC’s Harwood Yard facility as seen on 08 October 1989. In the background is the recently-constructed locomotive shop and office complex. To the left are some relics from the Illinois Central days. Evansville was the jewel in IHRC’s crown—the “heavy railroading” end of a short line company. 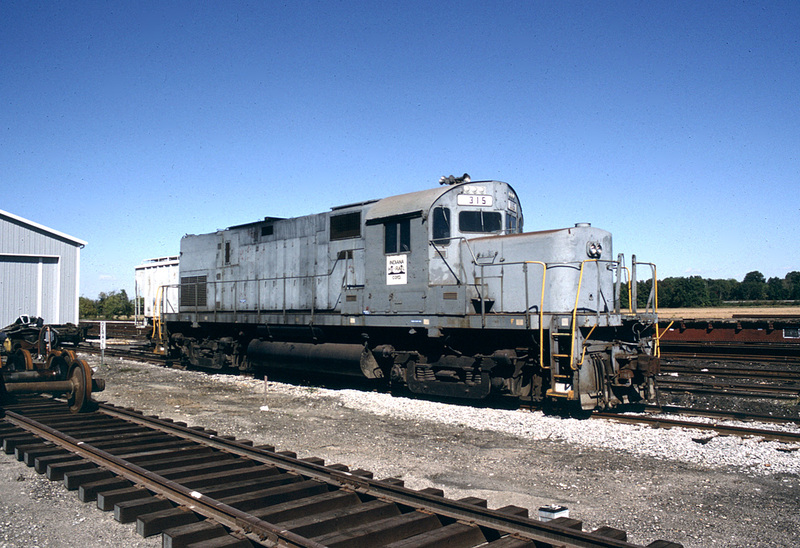 IHRC operated a former-Illinois Central line from Evansville north to Newton, IL on former-Illinois Central trackage, with a branch line from Poseyville to Owensville, IN that was owned by local shippers but operated by IHRC. From Harwood Yard, IHRC trains operated on trackage rights over the CSXT to the river port at Henderson, Kentucky. Evansville also had responsibility for the Huntingburg Cluster, a set of recently-leased former-Norfolk Southern lines located east of Evansville serving Dubois, Cannelton and Rockport Junction. Harwood was a relatively large yard on the north side of Evansville, and IHRC had recently constructed here their main locomotive shop (supplemented by the smaller shop in Connersville), with adjoining administrative offices and support facilities. Behind the offices were located two sleeping rooms and toilets/showers, and one of these rooms was to be my “home” for the next few weeks. IHRC C420 #315 is seen at Harwood Yard on 08 October 1989. This locomotive was built for the Louisville & Nashville Railway in 1966 as their #1315. The show in Evansville was run by Gary Bright, IHRC’s Vice President of Operations. A former-Milwaukee Road trainmaster, Gary was a no-nonsense kind of guy. He was a firm and professional railroader, but also showed a soft side for the “new kid”. The office itself was run by Diana Becher (sister-in-law of IHRC president Powell Felix), and the locomotive shop was run by George (last name? ), a new-hire like myself, who was IHRC’s chief mechanical officer and had come from a regional railroad in the south. While at Evansville, I also met my future boss, trainmaster Wanda Camp. She was also a new hire, having come from the South Tennessee Central Railroad, a short line in Tennessee. She would also be assigned to Defiance, OH as soon as operations started there. Wanda was the first female hired for a management position at IHRC. The main business at Evansville was moving grain, in unit trains and individual carloads, from elevators up the line in Indiana and Illinois to the Riverport at Henderson. This required a lot of horsepower, and Harwood Yard was certainly an interesting place for locomotive enthusiasts in those days. 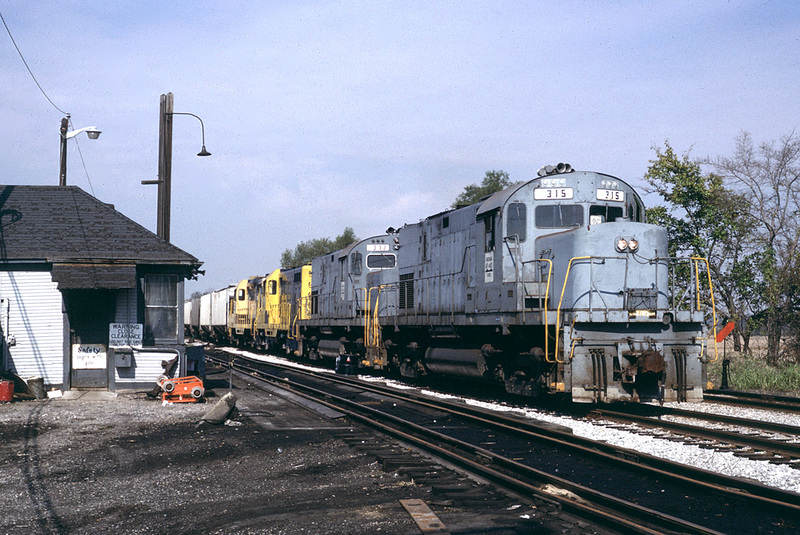 Alco power ruled the roost, with C420s and rare RSD-15s running daily. These had recently been supplemented by former-ATSF rebuilt GP-7s. Out in back of the shop was a deadline of Alco units, some supplying parts to keep others running, and some awaiting a return to service, including a set of former-BN C424s that had come via the Kyle Railroad. The tracks in back of the locomotive shop at Harwood held a number of locomotives waiting for “better days”, as seen here on 08 October 1989. 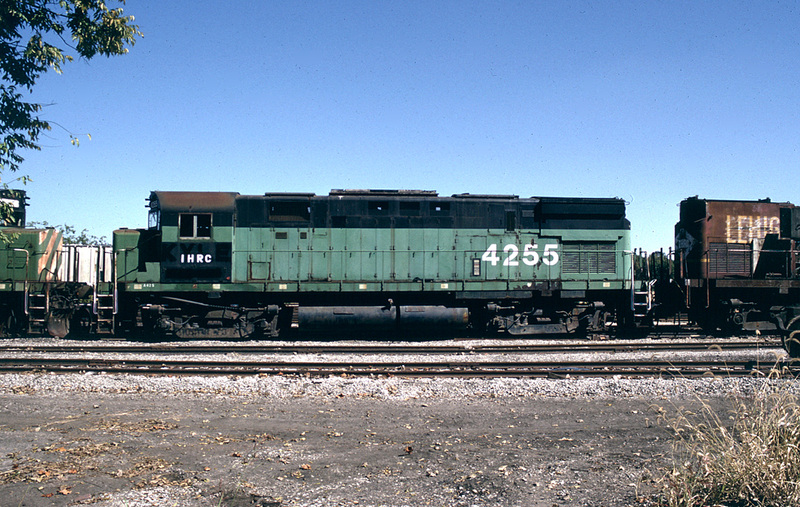 IHRC C424 #4255 came via the Kyle Railroad; it was built for the Spokane, Portland & Seattle Railway in 1965 as their #315. 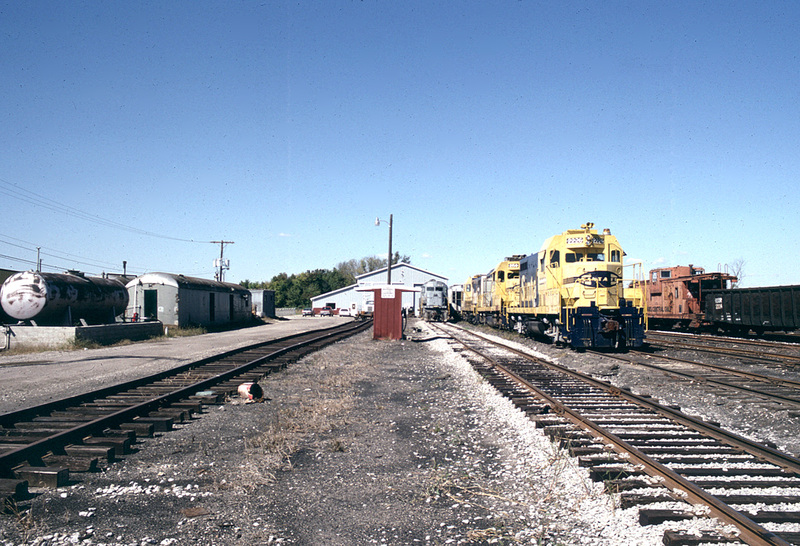 Photo at Hardwood Yard, Evansville, IN on 08 October 1989. After settling in to my room, I was immediately sat down at a desk and told to start processing paperwork. The new IRCS (Integrated Railcar Control System) had just come to Evansville, and there was a push to enter all the data for the last 1-2 months into the system, to speed up per-diem accounting (the money the railroad pays for using each rail car on its line). This consisted of stacks of switch lists and consists, often for unit grain trains. Each car number had to be entered into the system, and along with its movements. For a 100-car unit train, this took a while! In between I also started to answer radio calls from train crews, take telephone calls, and generally become acquainted with railroad office work. On my 2nd or 3rd day in Evansville, I was told I needed to work a night shift, as there would be a train out on the road. To be near the radio, I spent an uncomfortable night on a sofa in Gary Bright’s office. About 3 a.m. there was a call from the train: “Hardwood Yard, are you there?”. “Yes,” I answered. “OK, have a good night, just checking” came the reply. Back to sleep… Was this a railroad initiation ritual? I never had to repeat it, in any case. 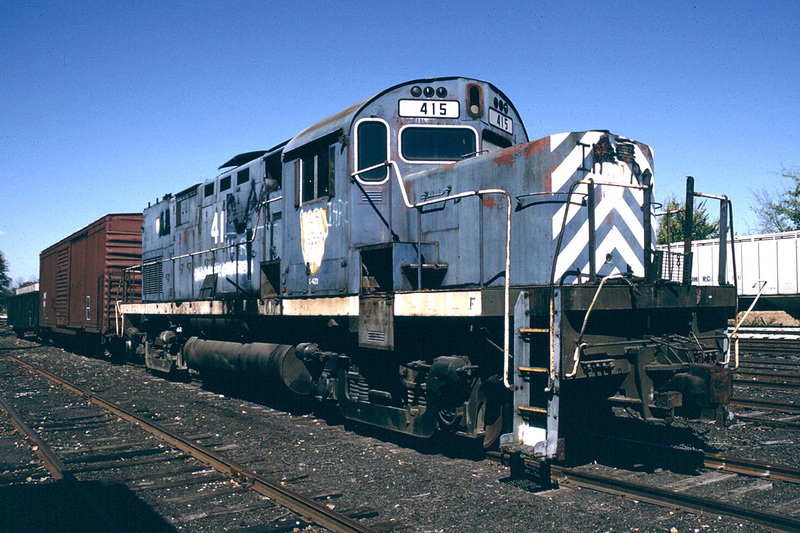 IHRC C420 #415 was a part donor, still in Delaware & Hudson Railway paint. This unit was built in 1964 for the Lehigh Valley Railroad as there #415, and photographed at Evansville, IN on 08 October 1989. I also started to get out on the railroad a bit. Often this involved picking up or dropping off crews out on the road. When a crew had worked their 12 hours, the train had to be stopped wherever it was and the crew brought in. This might be a short local drive for me, or I might even have to drive up to Browns, over an hour away. The company had several pickup trucks in various states of repair, and one of these was always used for the shuttle trips. Another day I was sent on a road trip to the Illinois Central Railroad shops at Centralia, IL. The IHRC had run out of torpedoes, devices that are clipped to the rail and explode if a train runs over them—used as a warning signal. None of the courier services such as UPS would accept such a dangerous package, so I was sent over to pick up a crate and bring back in the back of a company truck. On the return trip I had my fingers crossed that I wouldn’t hit a bump which would set them all off! 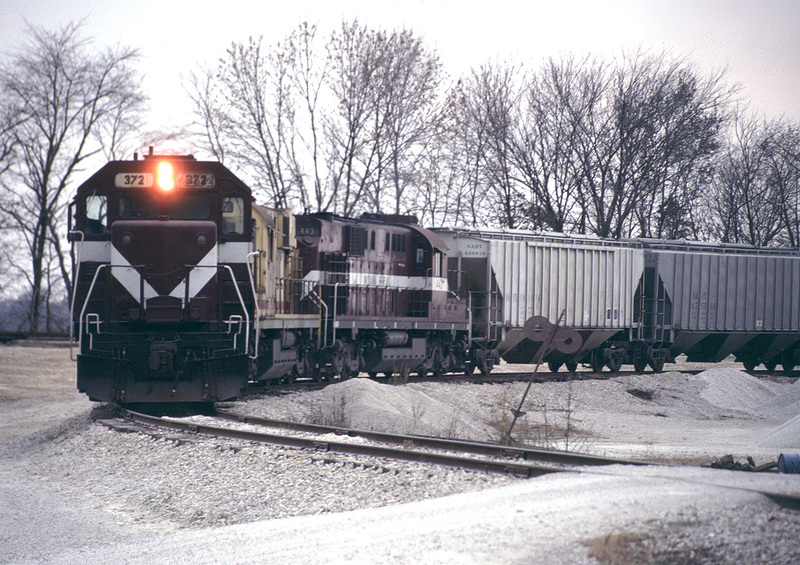 IHRC 315 waits to lead a unit grain train south out of Harwood Yard in Evansville, bound for the riverport in Henderson, Kentucky on 08 October 1989. The time I spent in Evansville (and Connersville) was great for me as I was on per-diem the entire time. The company paid for my motel in Connersville (and provided the room at Evansville). Every meal was taken in a restaurant (including too much fast food! ), all paid for by the company. Evansville itself was a dull place—a city of strip malls. The downtown area itself was one of the most decayed and dead centers I have seen in medium-sized city, although there was a classic Art Deco Greyhound station. I did a bit of railfanning on my days off, and once even followed and photographed an IHRC train from Browns to Evansville. 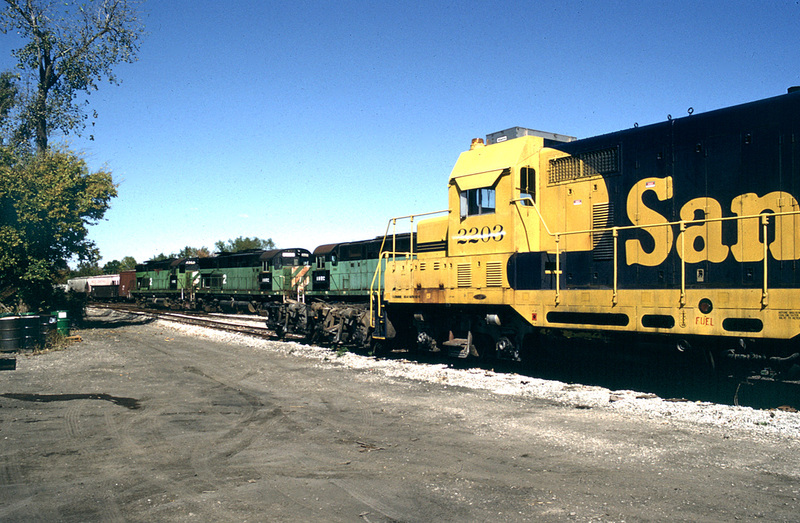 IHRC 372 and the two RSD15s work the interchange at Browns, IL on 05 November 1989. This photo appeared in the 1990 IHRC company calendar! My stay at Evansville continued into early November, and by then I was getting tired of life on the road. Fortunately, the paperwork had finally come together for the IHRC takeover of the Maumee District, and it was time to move to my “permanent” base at Defiance, Ohio. Quite the operation. Hope u didn’t stay long…..